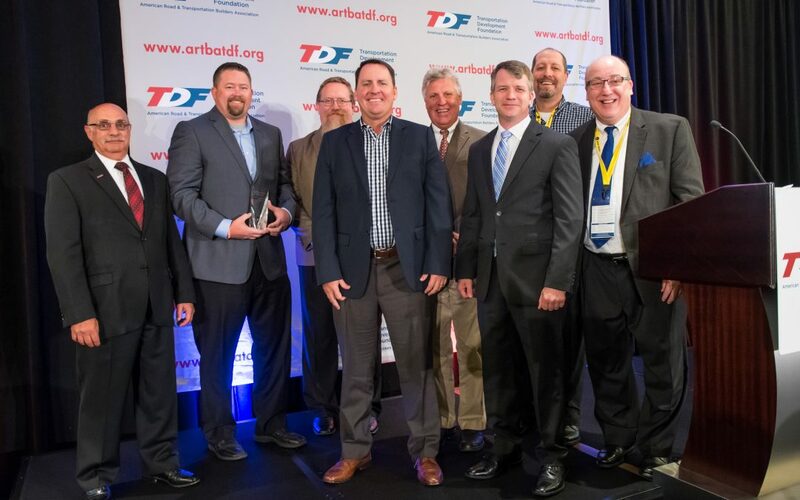 Left to right – ARTBA Foundation Chairman Paul Yarossi, HNTB; Bobby Greer, Superior Construction; David Dostaler, Kraemer North America; Bryan Stone, Superior; Mark Greenhalgh, Kraemer; Paul Albrecht, Barriere Construction; Ken Morrison, Kraemer; and ARTBA SVP of Safety Brad Sant. The annual awards promote worker safety and health as core values of the transportation design and construction industry. Finalists are selected based on objective information provided to ARTBA that demonstrate outstanding safety performance during the previous year. Key principles of safety excellence include management commitment, employee participation, incident investigation, auditing, planning and risk assessment. Representatives from finalist companies made presentations at the convention to a panel of industry professionals. The awards were presented during the Foundation’s Oct. 1 luncheon.